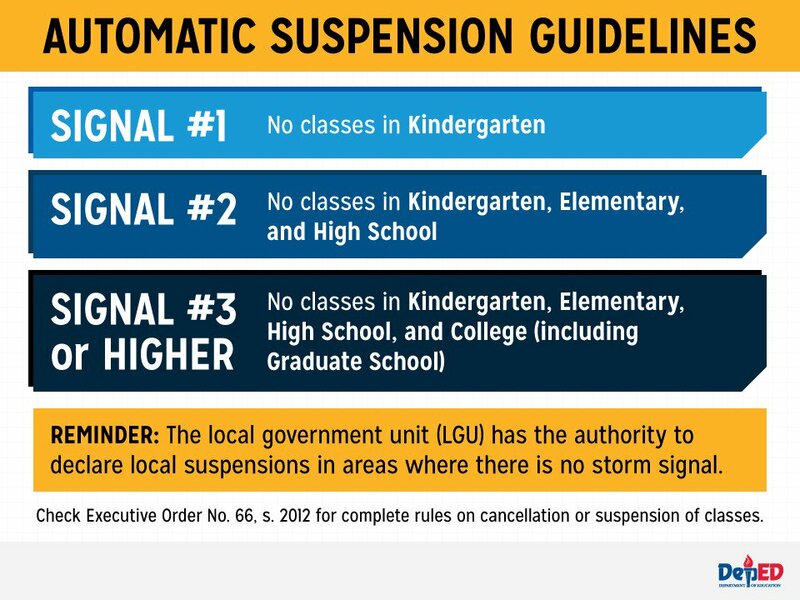 MANILA, Philippines - Class suspensions on September 14, 2016 (Wednesday) are announced at certain areas by Local Government Units (LGU) due to bad weather conditions brought by Typhoon "Ferdie". As of 10:00 PM today, below is the list of areas with class suspensions on Wednesday, September 14, 2016. At 4:00 PM today, the eye of Typhoon "FERDIE" was located based on all available data at 165 km East of Basco, Batanes (20.2°N, 123.5ºE) with maximum sustained winds of 215 kph near the center and gustiness of up to 250 kph. It is forecast to move West Northwest at 24 kph. The center of Tropical Storm outside the Philippine Area of Responsibility (PAR) with international name "MALAKAS" was estimated at 1,625 km East of Luzon (14.6°N, 136.7ºE) with maximum sustained winds of 85 kph near the center and gustiness of up to 100 kph. It is forecast to move West Northwest at 20 kph. Stormy weather is expected over the provinces of Batanes, Ilocos Norte, Apayao and Northern Cagayan including Babuyan group of islands. Rains with gusty winds will be experienced over the provinces of Ilocos Sur, Kalinga, Abra, Isabela and the rest of Cagayan. Cloudy skies with light to moderate rains and isolated thunderstorms will be experienced over Metro Manila, Western Visayas, Zamboanga Peninsula, Autonomous region of Muslim Mindanao (ARMM) and the rest of Luzon. Partly cloudy to cloudy skies with isolated rainshowers or thunderstorms will prevail over the rest of the country. Moderate to strong winds blowing from the southwest will prevail over the rest of Luzon and its coastal waters will be moderate to rough. Winds will be light to moderate coming from the southwest to west over Visayas and Mindanao with slight to moderate seas. We advise our readers to bookmark this page or check back for September 14, 2016 suspension of classes updates. You may also follow us via social media accounts at Facebook and Twitter.